If only he had hit a 'Glam Slam' ... 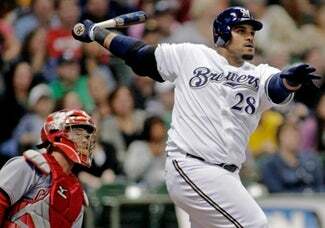 Prince Fielder's NL-leading and franchise record 46th homerun gave the Brewers an edge as Milwaukee beat Cincinnati, 5-3, to gain some ground in NL Central race. Milwaukee sits a game behind the Cubs, who split two against the Cardinals. Fielder, who also homered on Friday night, extended his career-best hitting streak to 13 games and is batting .422 with seven homers and 12 RBIs in September. Can you say, M.V.P.? Good. Can you say, otorhinolaryngologist? I can't. • Statement Game Josh Beckett (three hits over seven innings) became the majors first 19-game winner to help the Red Sox rout the Yanks, 10-1. The bounce back win increases the Sox's lead to 5 1/2 with two weeks and a day to play. Boston's Criss Angel number is down to nine. • Your Daily NL West Update... Luis Gonzalez, his three-run biz-bomble and the Dodgers beat the D-Backs to move within 3 1/2 games of first in the West race, while the Padres sit two back after blanking the Giants, 6-0. • Keep Rollin' Rollin' Rollin' Rollin' (What?) Jimmy Rollins two-run triple over the Mets shallow defense rallied the Phils to their seventh straight win over the Mets, 5-3. Philadelphia now trails the Mets by just 4 1/2.